DALLAS, July 12 (Reuters) - President Barack Obama on Tuesday praised Dallas police officers including the five slain at a protest against police violence last week for saving lives during the deadliest day for U.S. law enforcement in almost 15 years. "We know that the overwhelming majority of police officers do an incredibly hard and dangerous job fairly and professionally," Obama told a memorial service for the slain police officers. "They are deserving of our respect and not our scorn." "And when anyone, no matter how good their intentions may be, paints all police as biased or bigoted, we undermine those officers we depend on for our safety," Obama added. Former U.S. Army Reserve soldier Micah Johnson, 25, gunned down the officers in an ambush on Thursday after expressing anger over recent police killings of black people. 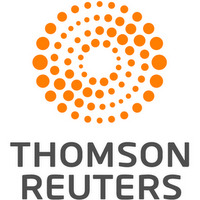 Johnson then was killed by an explosive-laden robot sent in by police. Johnson, who was black, opened fire during a march protesting the police shootings last week of two black men in Baton Rouge, Louisiana and outside St. Paul, Minnesota, the latest in a string of high-profile killings that have stirred a deepest debate on race and justice in America. "We mourn fewer people today because of your brave actions," Obama told a crowd several hundred people, including many uniformed police officers, at the Morton H. Meyerson Symphony Center. "Despite the fact that police conduct was the subject of the protest, despite the fact that there must have been signs or slogans or chants with which they profoundly disagreed, these men and this department did their jobs as the professionals that they were." 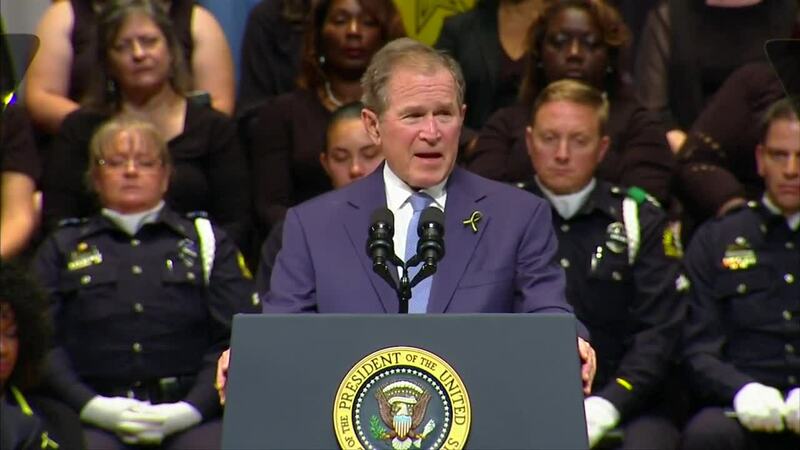 Obama's predecessor, President George W. Bush, also addressed the packed hall, where five chairs were empty of people, holding folded American flags, in memory of the slain officers. "At times it feels like the forces pulling us apart are stronger than the forces binding us together. Argument turns too easily into animosity," Bush said. "We do not want the unity of grief nor do we want the unity of fear. We want the unity of hope, affection and high purpose." For some, a portion of the former president's comments could be viewed as a subtle jab aimed at the presumptive Republican presidential candidate Donald Trump. "Too often we judge other groups by their worst examples while judging ourselves by our best intentions," Bush added. Following the ceremony Obama planned to meet with the families of the slain policemen and others who were wounded. The slain officers were Mike Smith, 55; Lorne Ahrens, 48; Michael Krol, 40; Brent Thomson, 43, and Patrick Zamarripa, 32. Obama told senior law enforcement officials on Monday that he sees the Dallas shooting as a hate crime, or one motivated by bias, said Jim Pasco, executive director of the National Fraternal Order of Police, who was in the closed-door meeting at the White House. Hate crimes, which carry more severe penalties, are offenses committed with an added element of bias against a person or group over race or ethnicity, religion, gender or gender identity, sexual orientation or disability. Pasco said Obama drew a parallels between the actions of the Dallas shooter and Dylann Roof, the man prosecutors say espoused white supremacist beliefs before fatally shooting nine black people inside a church in Charleston, South Carolina in June 2015. Johnson's death makes the question of charges against him moot, but Pasco said police unions are using the incident to lobby for a change to a federal statute that would allow the targeting of police, regardless of their race, to be charged as a hate crime. White House officials did not dispute Pasco's account of the meeting. As he has done repeatedly after mass shootings in the past several years, Obama reiterated a call for stricter gun control in the United States following the Dallas attack. The Senate took up the issue after an attack on a gay nightclub last month in Orlando that killed 49 people and was the worst mass shooting in modern U.S. history. But senators failed to agree on any one approach. While Democrats in the House, along with some Republicans, have been clamoring for legislation, deep divisions among Republicans who control the chamber have prevented any legislation from even reaching the House floor. The death toll in Dallas was the highest for law enforcement on a single day in the United States since the Sept. 11, 2001, attacks. Nine officers and two civilians were also wounded in the Dallas shootings. Outside the hall, Sharice Williams, 41, who drove the roughly 95 miles (153 km) from Waco, stood in hopes of catching a glimpse of the president. "My heart is heavy. I'm tired of seeing my brothers and sisters killed, but the police don't deserve that," said Williams, who is black. "I'm praying that Obama being here brings us some kind of peace."